Content: - Periodontal maintenance therapy for teeth 34 and 35, including the regeneration of a bone defect using bone replacement material, collagen membrane and sutures. - Curettage for treatment of periodontal pockets. 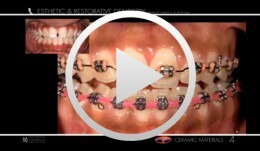 - Treatment of gingival pressure sores caused by tight-fitting orthodontic apparatus. 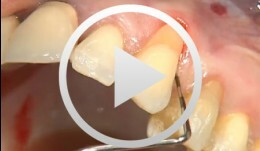 - Incision of buccal attachment to relieve gingival pressure for elimination of gingival recession. Expert presenter PD Dr. Daniel Thoma is a Head of Academic Unit at the Clinic for Fixed and Removable Prosthodontics and Dental Material Sciences, University of Zurich, Switzerland. 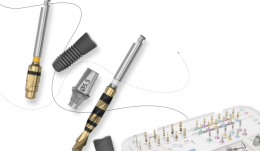 Long-term successful outcomes with implant therapy are based on a number of parameters. Among these, the critical assessment of the peri-implant soft tissues and subsequent therapeutical interventions are considered key factors. 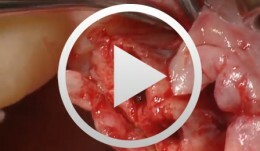 Dr. Dominik Büchi performed a ridge preservation to keep the soft tissue volume. He then placed an implant 8 weeks later with simultaneous GBR. 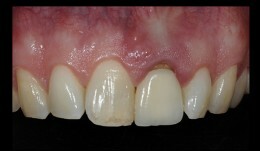 The final emergence profile was created by a fixed provisional crown. Procedure: - Case evaluation - Incision technique - Implant placement - Membrane adjustment and fixation - Introduction of replacement material - Flap mobilization - Suture technique Contents: Implantation was desired for replacement of a missing upper canine tooth and the adjacent lateral incisor tooth. The initial case evaluation revealed a relatively narrow gap between these two teeth in addition to extensive hard and soft-tissue defects. 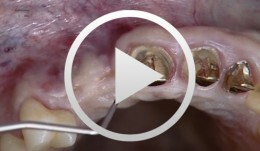 We selected an incision technique that made it possible to do the augmentation work yet subsequently achieve a tension-free flap closure. Since the bony defect was large while the available space was limited, we had to go for the best possible compromise in regard to implant insertion. After the implants had been inserted, augmentation was carried out using a non-absorbable, titanium-reinforced membrane, bone replacement material, and an absorbable membrane. Extreme flap mobilization was needed to achieve flap closure. An optimal suture technique was used to complete the surgery. Content: Surgical flap creation and elevation; Use of drill template for exact determination of implant position; Implant site creation; Site preparation / tapping; Bone compaction; Insertion of the implants; Impression-taking; Wound closure; Later implant insertion; Dental lab work; Creating the model with laboratory implants; Shaping the bar frame; Adapting the laser welded frame to the model; Manufacturing the tooth replacement, Fitting the bar into the tooth replacement; Finishing work. Objectives: Use of a soft tissue graft for recession coverage at tooth 23 and for gingival augmentation. Content: 1. 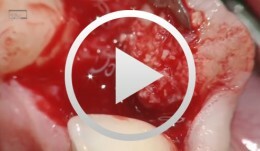 Incision around tooth 23, intra-sulcular preparation, mobilization of coronal sliding flap, and pre-flap preparation. 2. 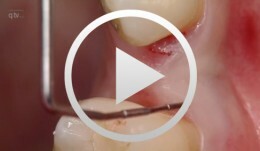 Root smoothing, reduction of ground cavity with diamond burs from Perioset system. 3. 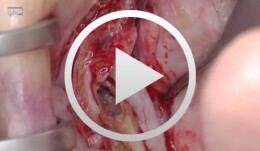 Preparation and harvesting of connective tissue flap from palate, Emdogain application, and wound closure. 4. 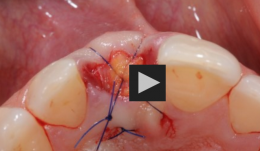 Placement of interrupted interdental sutures for fixation of connective tissue flap.  Objectives: To demonstrate that dynamic guided surgery is as predictable as conventional surgery. Methods: Partially edentulous patients requiring a fixed rehabilitation were selected for this pilot study. No specific contraindications were established, and smokers were not excluded. An impression was taken pre-operatively using an irreversible hydrocolloid (Cavex CA37®) to fabricate a diagnostic cast for moulding the surgical stent (NaviStent®). Afterwards, a standard cone-beam CT (CBCT) scan was made with the NaviStent® in place using a Planmeca Promax 3-D Max®. Images were converted into DICOM files and transformed into a 3-D virtual model using the Navident® software. The potential implant locations were planned in a prosthesis-driven way. For preparing the osteotomy, the drilling axis of the handpiece and the twist drills were calibrated. The osteotomies were prepared at low speed using a high level of cooling. The navigation software guided the drilling procedure in real time. Before installing implants, an extra calibration procedure was performed for tracking the implant. 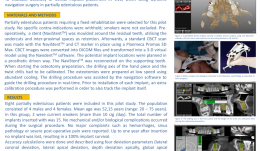 The aim of this pilot study was to determine the clinical outcome up to 12 months post-operatively for implants installed using the Navident® guided surgery system. Results: Partially edentulous men (n = 6) and women (n = 7) were included in this pilot study (mean age 52.15 years; range 20–75). Out of these 13 patients, two were current smokers of more than 10 cigarettes per day. Twenty implants were inserted. No mechanical or biological complications occurred during the surgical procedure, and no major complaints were reported, such as hemorrhage, sinus pathology or severe post-operative pain. No implants were lost up to 1 year after insertion, resulting in 100% implant survival. Conclusions: Based on the results of this pilot study, real-time navigation is a promising technique. However, there is not yet enough evidence to show that the method is as safe and predictable as conventional implant surgery. Objectives: Understanding the bony anatomy at the site of implant placement is essential for implant success. Computed tomography (CT) is generally considered the gold standard for assessing bone morphology, however there are situations in which it is not practical. 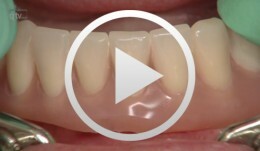 The ridge-mapping technique has been advocated as a convenient way to assess site suitability for implant placement, and was used in this patient to plan a single dental implant. Methods: An unrestorable maxillary lateral incisor tooth was extracted and the socket was preserved using Bio-Oss[tm] and a Bio-Gide[tm] membrane. This healed undisturbed for 2 months, then alginate impressions were taken and plaster study models fabricated. A mapping stent was fabricated from the plaster model using rigid acrylic material to ensure stabilisation[stability?]. The stent overlapped the buccal and palatal mucosal tissue. Holes were drilled in the stent at 2mm, 4mm, 6mm and 8mm from the alveolar crest, allowing a size 20 endodontic file to pass through. At each pre-drilled site, the depth was measured from the acrylic stent surface to the bone. The cast was then sectioned and measurements were transferred to the cast to provide an outline of the underlying bone. Following clinical assessment and outline measures, a bone level Strauman implant of 3.3-mm diameter and 12-mm length (SLActive was planned. Local anaesthesia was administered before making a slightly palatal incision and reflecting a full-thickness mucoperiosteal flap. The alveolar ridge was measured using a caliper. The osteotomy was prepared using standard drills and the implant was placed 3mm from the cervical margin of the proposed restoration. Results: Ridge mapping and direct measurement with calipers yielded similar dimensions of the alveolar crest. Conclusion: This report demonstrated that ridge mapping using endodontic files and a model-based template gives an accurate representation of the underlying alveolar bone. This technique may be suitable when standard radiographic techniques are not possible.